This is one of my favorites written by Michael W. and Debbie Smith – sung by Philips, Craig and Dean. Enjoy! I sit here with my second cup of coffee to start out my music week with students. 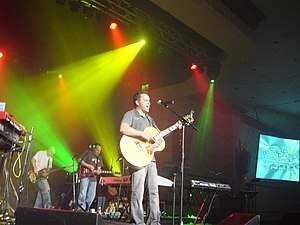 I am listening to the following song written and sung by Matt Redman, a song that has been popular lately on Christian radio. ( I do not listen to Christian radio unless it’s internet classic Christian without commercials.) It was introduced by our youth to our church family yesterday. It is simple and beautiful. It has been running through my head since we first heard it. don’t know why some songs speak to me. Others I literally have to ‘put up with’ in order to get through them. I am very picky when it comes to music. And although I listen to any genre and decade of music – it has to be really good before I like it. This goes for classical – to classic rock and everything in between. Unless a song really speaks and moves me – it is just noise. This was sung this morning in our worship service – led by our new worship leader, Kelsey Hendrickson. It was beautiful and very moving. I had to share it with you – to remind you – you are loved. I stumbled onto this song and this artist – Wow – incredible talent and song! Enjoy!